Over a medium high heat, melt your butter and oil together in a saucepan and add your flour, using a wooden spoon to stir the flour continuously. Add ½ cup of milk initially, stir well and then In a saucepan, heat the 2 tablespoons olive oil and the butter over medium heat. Your mixture should already start to thicken and when it does, add the rest of your milk. Keep stirring it over a medium heat to stop it from forming lumps. Turn the heat down slightly and keep mixing for about 8-10 minutes. Add the ham, chives, paprika and some salt/pepper to season and keep stirring. Prepare making the croquettes, beat your two eggs in a separate bowl and get your breadcrumbs ready on a plate. Shape your croquetas into the desired shape and roll them first in the breadcrumbs, then into the egg, and then re-coat in more breadcrumbs. To fry, heat at least 3-4 cm of oil in a pan until smoking hot. 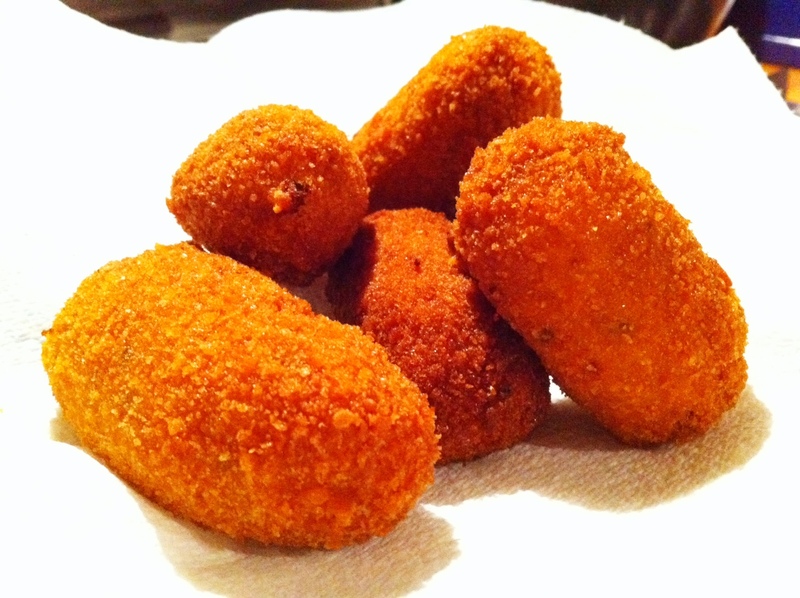 Fry your croquetas for 1-2 minutes, turning gently until golden brown. Don’t fry them in batches of more than 3-4 to ensure you don’t reduce the temperature of the oil. Drain on kitchen paper and keep warm in an oven while you fry all your croquetas. Be careful when you eat them as they’ll be piping hot on the inside!